Always on the outlook for new and gourmet ideas, of great integrity, sincere and generous, Michel Kayser doesn’t deceive, neither in life nor in the kitchen. Born in 1955 at Bitche in the Moselle region. As a very young apprentice with Pierre Sternjadob in the Auberge Albert Marie in Rosbruck, a vocation reveals itself to him and he will do all within his power to become a Chef. He completes seasons at the restaurant “Le Bourgogne” at Evian-les-Bains, at Courchevel, at Palavas les Flots, at the heart of the brigade of Paul Alexandre, with René Bouvarel at St Hilaire du Rosier in the Isère. Upon the death of his father, in 1978, he returns to the East of France, to “Kammerzell*” in Strasburg before joining a more contracted team in Sarreguemines as Head Chef. The decisive turning point, Michel Kayser decides to settle in the South-East of France and take over the restaurant “Alexandre”. The transition is rough. In 1987 a first and unexpected star rewards a team which had been reduced to its strict minimum. Over the years, Monique and Michel Kayser, working in harmony at all times, work relentlessly to turn this place into their Restaurant. When, in 2001, they finally become the owners, they experience this as a liberation. In 2003 important transformations are undertaken and in 2007 they obtain the supreme reward: 2 stars in the Michelin Guide. It is a huge joy for the entire team! Two years later the restaurant becomes part of the prestigious chain « Relais et Châteaux”, which gives Michel Kayser the status of “Grand Chef” and assures him with the certainty that the Restaurant “Alexandre” has become an exceptional place. 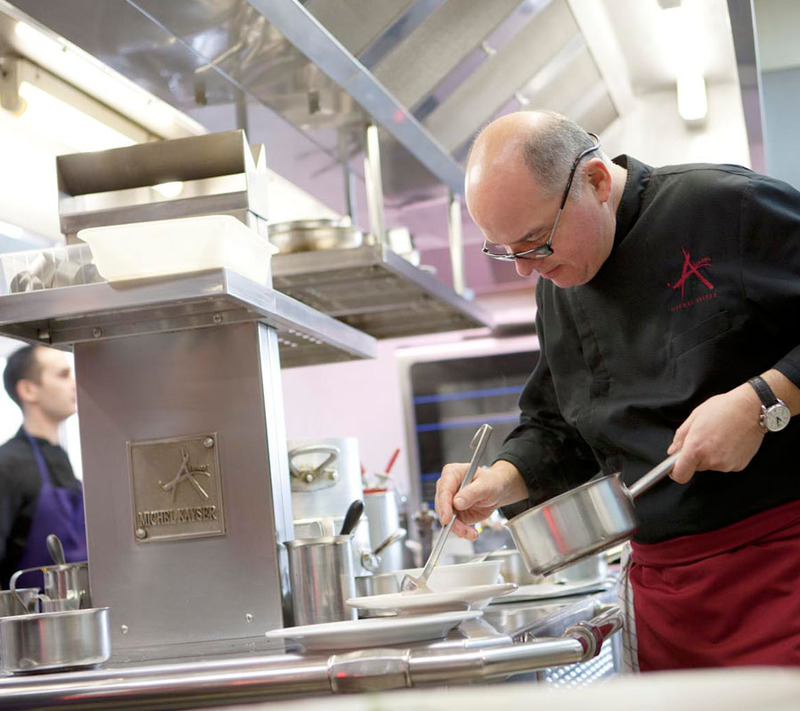 In 2014 the Restaurant “Alexandre” joins the association “Les Grandes Tables du Monde” (the greatest gastronomic tables of the world) and the Guide Champénard confers the title of “Chef of the year” to Michel Kayser. In 2016 the “Toques Blanches Lyonnaises” designates the Restaurant Alexandre “Grande table de l’année” while Gault Millau awards Michel Kayser and his team with two youdistinctions: a « Gault Millau d’Or » and the price of the « Carte des Vins » Occitanie. Michel Kayser can joke about anything, except the absolute quality of his products. It is not unusual to see him roaming the country side, building a relationship of confidence with some local producers. He looks, touches, smells, tastes, anticipating each texture, colour, flavour. He visits the family Baeza in the Coteaux des Costières, passionate pigeon breeders. He strides along the plains of the Camargue, the natural habitat of bulls, and they stand in mutual observation. Magali Saumade reveals some secrets to him and gives him her best cuts of bull meat. He goes to meet the discrete producers who abound on the plateaus of the village to find his courgette flowers and some of his vegetables. He loves slipping away between two shifts to go and choose his fish while exchanging with Paul Gros, a fisherman, a love of the Mediterranean and its multiple treasures.